You hear a lot of talk about making suburbs into something more like cities, and if reporting like that of the Washington Post last week is any guide, it’s going to be a tricky sell to turn the talk into reality. 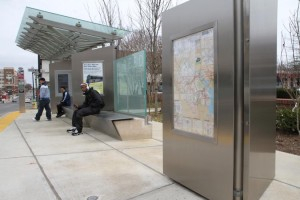 On March 24, the Post published a story about what it calls a “$1 million bus stop” in Arlington, Virginia. It didn’t cost $1 million, technically, and it isn’t just a bus stop. The Post showed signs of having known as much, but went ahead and made a new transit project sound like a boondoggle anyway and stoked enough outrage to have a major county transit improvement project put on hold. The stop is what Arlington transportation planners are calling a “superstop.” It is a prototype, the first of two dozen stops meant to handle both bus and, eventually, streetcar traffic down Columbia Pike, a four-lane commercial strip that runs three-and-a-half miles through the county from its outer suburbs to the edge of the Pentagon. At the Pentagon, buses unload at a very busy subway stop that takes people into Washington, D.C. Once the streetcar line is built as planned, the combined transit line is expected to carry about 30,000 passengers on a typical weekday. The hard costs to build the stop were $574,000. There were other costs, too, about $433,000, as Dennis Leach, Arlington’s transportation director, told me. 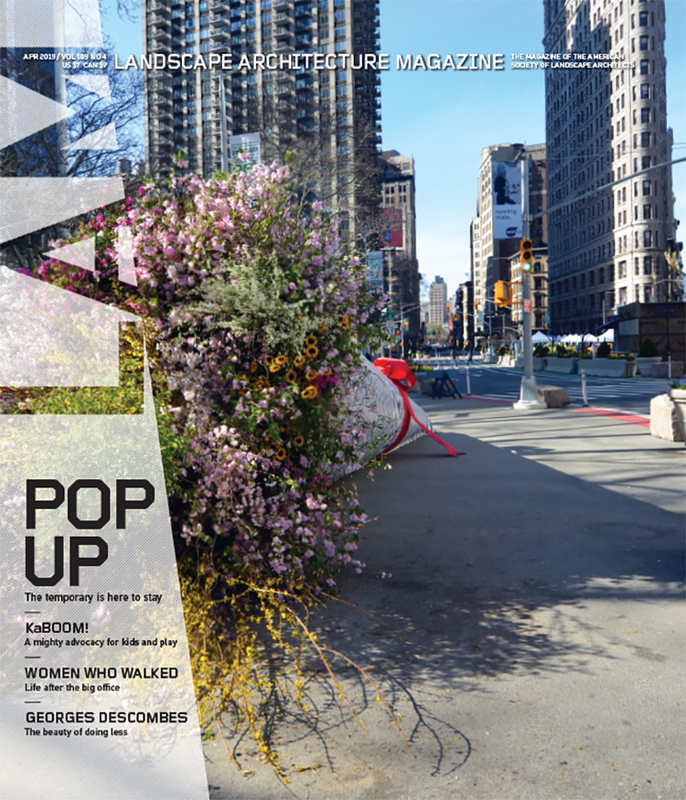 Those other costs involved design (by HOK), planning, reviews, fees, and so forth. There were also problems of construction delays, about 14 months beyond the four months originally scheduled. Arlington contracted the construction of three superstops to the Washington Metropolitan Area Transit Authority, or Metro, which wound up for its own reasons scaling down its construction operations. (Metro can barely keep a single subway station fully functional these days.) “This project really became an orphan” at Metro, so Arlington County ended that relationship with just the one superstop. Much of the $433,000 can be filed under research and development costs, one-time charges to create the first superstops that will spread over the creation of the other 23 stops. “Our intent was to do one [stop], evaluate it, and then go forward with modifications,” Leach said. Ah, but the Post reported that “[t]he county has budgeted $20.8 million for the remaining 23 stops, or about $904,000 for each one.” With this burning fact, the Post’s reporter headed out to the superstop in question and baited commuters who were waiting for buses to offer their thoughts about all this million-dollar business. Well, no. It’s made of stainless steel, glass, and concrete. It has real-time electronic displays to let commuters know when the next bus will arrive. Each stop will also involve a lot of work to relocate utilities underground, to make streetscape improvements, and install new street lighting. The costs may surprise commuters. They obviously surprise the Post. But they don’t surprise people who have designed transit systems in other cities. Rendering of Columbia Pike with planned streetcar. Courtesy Arlington County Department of Environmental Services. So be sure to dress for the weather and bring an umbrella on those rainy days. A couple of other points: Municipal planners don’t have much money for maintenance, so taxpayers, voters, whoever, ought to be glad whenever they use high-grade materials in building infrastructure; the good stuff costs less in the long run. And finally, Arlington County is known the world over for its clever mass-transit planning and for having placed a lot of new development around transit since the 1980s. The money the county spends today to improve transit and take cars off the roads is going to pay itself off and then some. Developers are already swarming around Columbia Pike with new six- to eight-story commercial and residential buildings where there has for decades been one long, thin retail strip. “The higher investment in the transit infrastructure is absolutely justified by the increased property values, tax base, higher ridership, less vehicle miles traveled, environmental benefits, and increased social capital of good, planned communities,” McCarter said. “An article like this one completely ignores what the bigger effort is about and focuses on the shocking headline.” That $1 million bus stop: a line the Post works almost to the last sentence, even though it might even know better, or should, given how much coverage the paper devotes to the region’s incessant gridlock and its crumbling highways. Correction appended (February 26, 2014): The original version of this story incorrectly cited the source of the photograph at the top of the story as the Arlington County Department of Environmental Services. The photo’s source is in fact Local News Now LLC. The credit has been corrected. We regret the error. on April 1, 2013 at 10:04 pm | Reply dan reed! “Outer suburbs?” If only Greater Washington kept its sprawl so close. Most would call that area (Bailey’s Crossroads) an inner suburb, having been built shortly after World War II. You’d probably have to go another 20 or 30 miles (at least) to find a place that qualifies as “outer” anything. Hi Dan…I mean Arlington’s outer suburbs. It goes to Baileys Xroads within Arlington Co.
Hi Brad, great and timely article. The distance between the Pentagon and Bailey’s crossroads is 4.1 miles. The entire county is just 26 square miles, the smallest in the U.S. So, Arlington has no outer suburbs. Brad, a great and timely article. But Dan is right. Arlington has no outer suburbs. The distance between the Pentagon and Bailey’s Crossroads is 4.1 miles. The entire county is 26 square miles, the smallest in the country. “dress for the weather and bring an umbrella” — I just don’t think people are going to find that attitude convincing or helpful. There are plenty of bus shelters around, and shelters on exposed platforms of area Metro stations, that offer shelter. If muggings etc. are a concern, they can have two or three entranceways. Also, about the infrastructure built in, which is ready for high voltage and communications, safety features — that’s interesting, but I haven’t heard specifics about what that might be. The expert cited here, about that, is in Portland, and seems to be just making an educated guess. Details would help. Thank you for a sane and informed explanation of the project. This is a long-planned and difficult to implement investment in the communities future. Once the initial “anti-everything furor dies down, this will be a project that serves millions of riders in the community. I currently use the 16 bus line and the stop at Columbia Pike and Walter Reed. I also support the eventual construction of the street car/light rail line. My issues with the stop are the overall poor design. While it may have heated concrete to stand on, the benches are stainless steel and ice cold now – I imagine they will be hot as hell when the sun hits them in the summer. The roof doesn’t cover the whole stop – but that doesn’t matter – because of the height and the angle it offers no protection from the rain (and hence the benches are usually wet…). The monitor is a great idea – but one or two people in the stop and no one can see it because of placement. If they had spent 1 million for a stop that was functional for those of us who use it everyday – and as a prototype for the remaining stops, then I would have no issue with it. The stop might “look fantastic” but overall it is an utter failure – not to mention the two years we were pushed off the corner while it was constructed. So the public got what they asked for but they don’t like it. It’s great to be transparent in your process, but reason and logic also has to be used. The designers are the professionals in their realm. It would be like walking into a lawyers office and telling them how to run a trial. 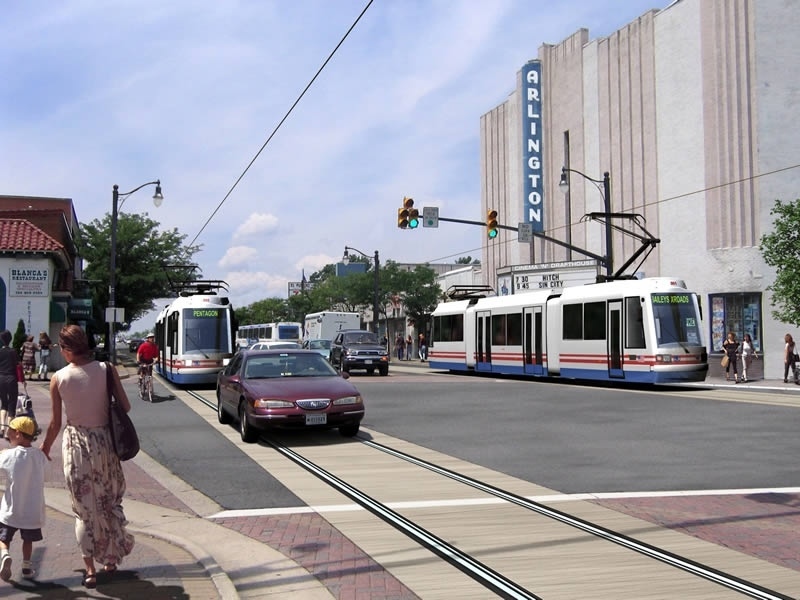 I like how the county’s rendering of Columbia Pike with streetcars doesn’t show a single brown person. That is probably one of the more accurate renderings I’ve seen as this is certainly going to be the result of the streetcar. Also, I think there will be major disappointment when the streetcars prove to be as unreliable as busses as they SHARE THE ROAD WITH traffic, just like busses. The problem is nobody in these planning offices were around when the original streetcar systems got removed. It wasn’t just a GM conspiracy, they don’t offer the flexibility of busses. The transit shelters in my town have sides that are glass on the top half, and certainly provide better weather shelter than the one photographed, which has some of the characteristics of a wind funnel. Otherwise, bhobbs63’s comments seem right on.